Saddle up for an adventure! 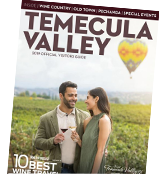 The trails throughout Temecula Valley’s wine country are perfect for exploration on horseback. Visitors to the region can bring their own horses, to be kept in care at one of the region’s many stables, or those wishing to try a new adventure can book lessons or a trail ride for a relaxing city-slicker adventure on the back of a gentle steed. Guided trail rides through Wine Country are available to explore the lush vineyards from a different vantage point, or to sample the fruit of the vine while on your adventure, consider taking a horse-driven carriage wine tasting tour that lets you sit back, relax, and enjoy the stunning beauty of the Temecula Valley. Wine country trails are perfect for horseback riding, or venture up to Vail Lake for breathtaking views of the valley. Bring your own horses and know they&apos;ll be well cared for at Galway Downs, Green Acres or any of our many local stables, or take lessons or book a trail ride there, as well.